People use fanny packs for different purposes. One of the usages is to convey gadgets while going out. Though smaller than a bag, it offers enough storage for your essential outdoor tools comfortably. But if you are planning to go for hunting, definitely you need some extra features like pockets and separate compartments in your fanny pack. Because you need to store hunting gears and devices such as a compass, GPS, flashlight, spare ammo, poncho, water bottle, etc. 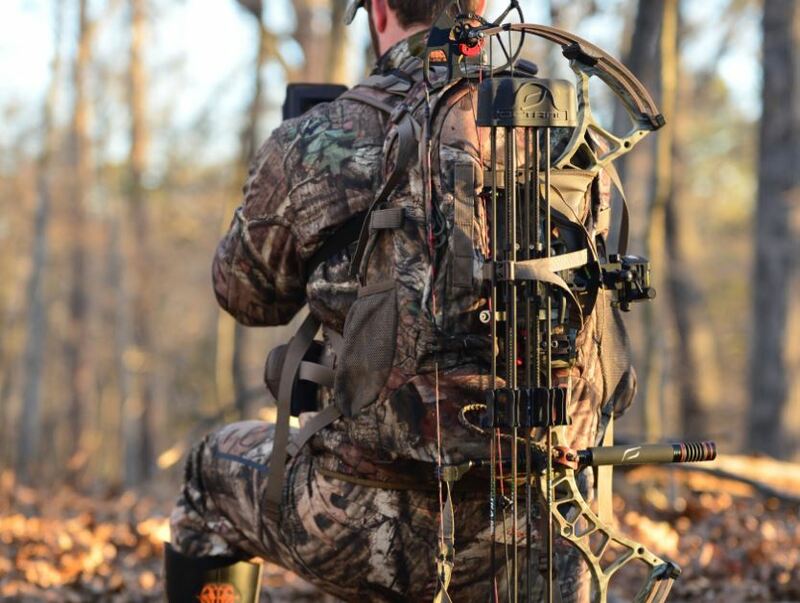 Besides that, the pack should serve all your hunting needs that will make your hunting enjoyable and reduce fatigue. 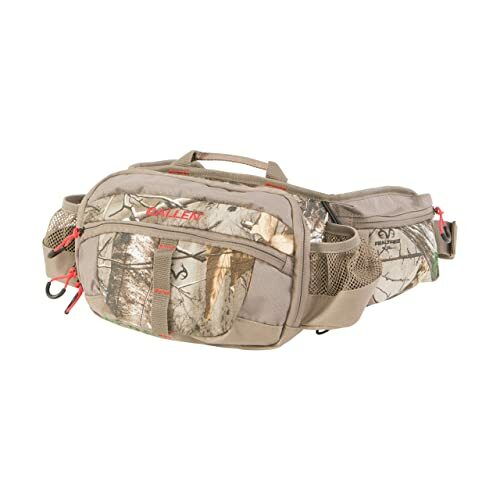 So, an excellent hunting fanny pack matters a lot for overall satisfaction and you should be careful enough at the time of choosing the best hunting fanny pack. 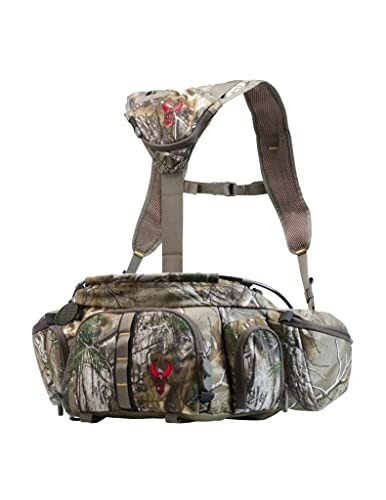 A good fanny pack makes your hunting enjoyable, and it is very important to select the best stuff. So, you need to know whether it is comfortable or not. 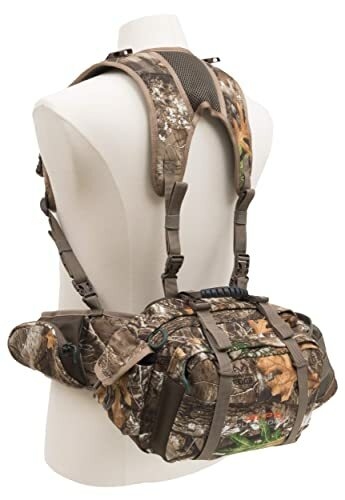 Though most of the hunting fanny pack have comfortable shoulder straps to distribute the weight between the hips and shoulder. You may also look for its waterproofness, quietness, and temperature resistant quality as well. There are many kinds of hunting fanny packs in the market and you may find it difficult to select the best one for you. So, we have listed the best hunting fanny pack. And reviewing them with pros and cons along with their various feature. Hope, it will help you a lot. If you are searching for the biggest and most versatile pack available in the market, you should check Badlands Monster Fanny Pack. Because it comes with 18.02 liter with more than 1000 cubic inches storage capability along with 7 Pockets, even you can use this pack in damp weather and appropriate for harsh hunting environment. A delron flex frame that sets it apart from other packs gives you support and stability. For having Badlands KXO-32 fabric, it is super-quiet and water resistant. Molded foam suspension allows maximum comfort to your body contour. 3 point adjustable shoulder straps for comfortable riding, 2 fold down workstation pockets where you can store a little but important kinds of stuff. Has a hydration compatible compartment that can hold up to 1 liter and it is included to take care of your health. This pack also comes with bedroll straps for attaching extra gears, Hypalon material is used for stress points that give high-strength. Badlands wants their fanny pack to provide you with long-lasting strength, so this pack is sewn with durable aramid bartacking and also they give you the unconditional lifetime warranty. It comes with all features that an ideal fanny pack should have. This ALPS OutdoorZ Little Bear is great both for hunting and scouting. It comes with various size pockets and 500 cubic inches storage, the ergonomic zippers help to make pockets easier to open and close while wearing gloves. Stress points on the pack have reinforced stitching for the durability. Two side pockets allow you to carry GPS or Rangefinder, a water bottle pocket to keep you hydrated. There is also a front pocket and the padded waist belt includes two pockets for additional storage. Two compression straps over the top for more security of your gear. The removable shoulder harness is attached to the pack by four buckles to carry a heavy load. They also offer optional accessory pockets that can buckle onto the front shoulder harness. Among them, binocular pocket comes with a padded main compartment and ultra-quiet magnets top lid for the security. Camera pocket has a front pocket for small items, mesh zippered pocket under top lid to keep everything organized and if you want to use camera pocket by hand, there is a carry handle on the top. The turkey call pockets come with friction call, small binocular pocket, three strike holder, diaphragm call pockets, two locator call holders and one box call holder. Altogether, it is a complete fanny pack for hunting. CREATOR Tactical Waist Pack is known for its simple and functional design. Though the design is simple, it is not dull at all. If you do not like a fanny pack that has a lot of pockets and straps then this pack is just for you. High-quality materials have been used to create this stuff durable. You will find Heavy-Duty Water resistant abrasive 600D nylon which is durable washed cotton canvas at the body surface area for extra usage and durability. One zipped front pocket, two side pockets, and close fitting zipper pockets allow you to store essential kits in this pack. The adjustable long waist is made of military nylon fabric that can fit up to 27 inches to 51 inches. The most important feature of this fanny pack, it is entirely water-resistant. So, you can go for hunting even in the damp weather. You can also use it for hiking, cycling, camping, shopping, fishing as well. You can easily carry this pack and you won’t feel excess weight which is impressive. Overall, it is a good and useful stuff that you may like to have in your collection. This stuff will be great if you love a small fanny pack and also don’t want to carry a large pack along with you so many hunting gears. This Huntvp Tactical Waist Fanny Pack is suitable for all kinds of outdoor activities such as climbing, hiking, shopping, traveling etc. The manufacturer uses high materials to make this pack durable and lightweight such as high-density 900D nylon and canvas, quality ABS buckle with detachable strap. The straps and buckle are strong and the buckle will not break unless you put it under excessive force. There is one zipped front pocket with an elastic belt inside can fix cards and smartphones, two side pockets, and close-fitting zipper pockets and main bag patch pocket. You can combind other equipment with it too, you can load all pockets with accessory kits even you can attach water bottle bag and this has been possible for using of Molle external expansion system in the pack. There is also long waist strap extender made with military nylon fabrics. This pack works well in different outfits and the design is also attractive as well as stylish. It is made with solid fabrics and good quality zips with solid stitching. This fanny pack is one of the best smaller tactical waist pack in the market. Muze always maintains the quality when they create various types of bags and packs. They have a good reputation and more than ten years of experience in this sector. This crossbody fanny pack is for them who are searching small pack. They use high-quality canvas cotton fabric and real leather to make this pack durable and comfortable. 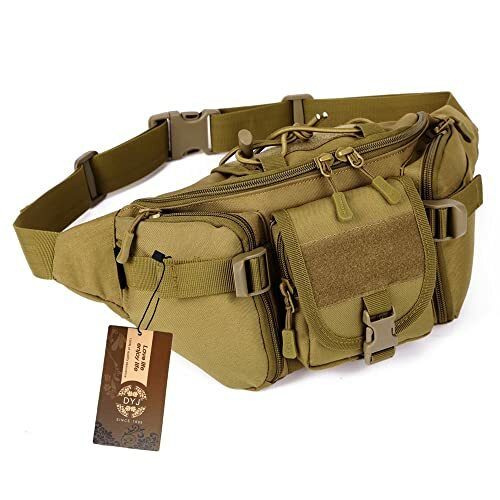 This waist pack has one main pocket with a durable zipper that allows you to store big accessories as well as small kits such as umbrella, headphone, and camera, etc. And one front pocket to keep phone or keys, one anti-theft back pocket ensures the security of your valuable stuff such as passport, cash, Id card, and many other things. This fanny pack also comes with an adjustable shoulder strap that can fit comfortably between 21.2 inches – 37.6 inches waist size. This pack is designed to fit your body better. The changeable feature makes this bag unique from others. It also can be used as a chest bag, waist pack, messenger bag, cross body pack or shoulder bag for different occasions. 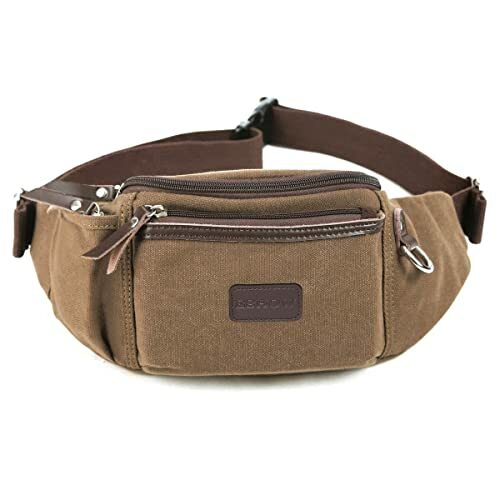 So, you don’t need to bother about your bulky bag anymore when there is Muze Mens Canvas Fanny Pack. 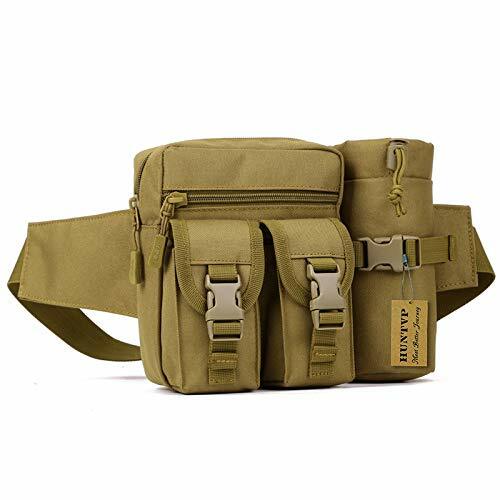 Eshow Men’s Canvas Waist Pack is a very good stuff that you can take along with you while going for hunting. You may call it a fanny pack or a waist pack or belt bag, the name makes you confused right! Well, this pack is made for hunting and also for other outdoors usage. You can use it as a bag as well as a fanny pack but not as a purse. That’s why all these names are mentioned to call the pack and you can use them as you like. The manufacturer uses premium quality canvas cotton that has high density to create this pack. Three main pockets provide storage to keep essential accessories like a cell phone, credit card, and other stuff. The major compartment allows you to store a little bit bigger stuff. Zipped front pocket and back pocket can store many kinds of essential tool. Adjustable strap fits between 28 inches to 44 inches waist. This fanny pack is designed and made for outdoor sports, morning jogging, and hunting. So, it is a great product for multiple usages and ensures maximum comfort at the different outfit. AecEnCiel is known for their superior quality. They always use the best materials to create their stuff. 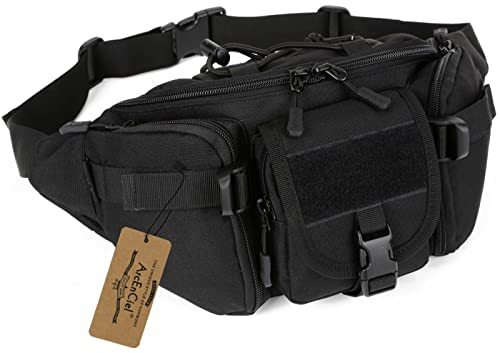 If you are searching a fanny pack that rides comfortably and carries a lot of accessories then you should check ArcEnciel Water Resistant Tactical Pack. You will notice that there is thick nylon stitch in the up-front which has 1000D high-density nylon that ensures the durability. This material can really last through some tough conditions. Even you can use it in a rugged environment. This pack provides large compartment to carry your big accessories. There are one front and two side pockets that you can put keys, cards, and all other stuff. These pockets are great for organizing everything you need. You can also add a water bottle, glass, and other stuff without any hassle with the help of Molle external expansion system. The adjustable belt got high ABS plastic that helps to resist cracking and breaking. You can use it for multi-purpose which is a unique feature of this fanny pack. It is made for hunting, camping, travel, tactical, and outdoor cycling. No matter how you use it, it will always make you feel comfortable. Large storage with many zipped pockets. 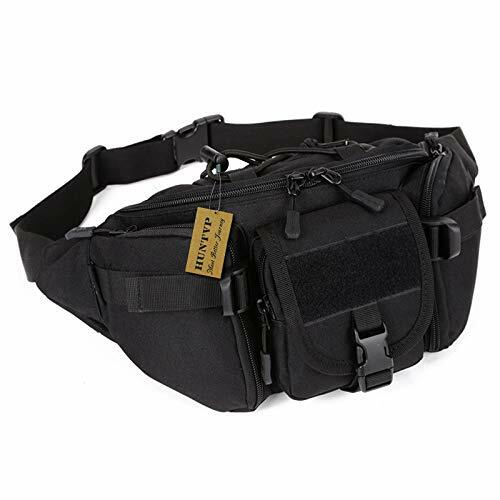 Huntvp Tactical Waist Pack is constructed of high-density 600D nylon and quality canvas. This fanny pack provides multi-functionality that suits for hiking, camping, hunting etc. You can use it as a tactical backpack, messenger bag, and shoulder bag as well. One zipped front pocket and two card buckle closure front pockets provide ample storage that you can carry all your needed equipment. There is a Molle external expansion system to extend the storage. You can put a water bottle in the water bottle holder for your hydration. There is a shoulder strap that can be adjusted from 27.56 inches to 44.88 inches waist. This tactical pack is scratch and temperature-resistant that suits in all natural condition. All feature makes it a perfect companion for any adventure. 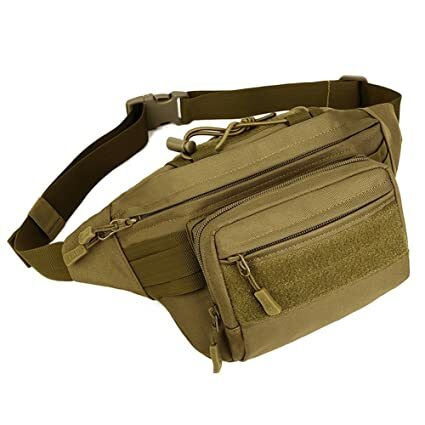 If you want to go for hunting at a nearby place and you also want to stay light as well as free from extra weight then Allen Excursion Waist Pack will be a great choice for you. It is made of 240g brushed tricot fabric in Realtree Xtra Camo that makes it super quiet. Though it is small, it provides enough room so that you can carry your items in two zipper main pockets and two small zipper pockets. There are also water bottle nets to carry small bottles of water. You can quickly find your gear even in low-light with the colored lining and zipper pulls feature. The waist belt with padded cool mesh and zippered accessories pocket is adjustable up to 52 inches. You will be satisfied by the comfort level while walking even with full loaded compartments. Overall, It is an ideal small hunting pack for quick trips. DYJ is doing a great business and they have a high reputation in the market for their tactical waist pack. Let’s have a look at the elements of DYJ Tactical Waist Pack which is made of High-density 1000D Oxford nylon fabric that makes it stronger than any other 600D nylon pack in the market. It provides large storage to store all your accessories. You can put your umbrella, cell phone, bottle, snacks, flashlight, in the main compartment. The back pocket is to give extra protection for your Id card, passport, and other essential stuff. There are three zipped front pockets that ensure extra storage facility. Besides that, MOLLE external expansion system allows you to carry other components. A padded shoulder strap comes with card closer buckle to adjust and it helps to keep your hands free by hanging in your shoulder. They use lightweight ABS buckle which is durable. You can use this pack for multi-functionality. You can utilize it for almost anything like Fishing, Cycling, Camping, Hiking, and also for Hunting. This fanny pack has all the features that the best hunting fanny pack should have. It fulfills all the needs that hunters love, so you should check this stuff. Be sure you are investing in the right thing, not on a counterfeit. The best indicator of a product is its quality. Before buying, you should check the quality of that stuff properly. 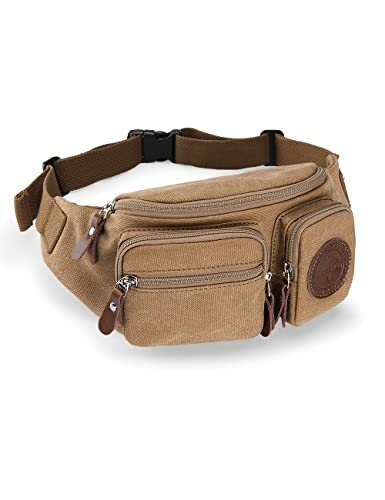 All these mentioned fanny packs are excellent in quality and are the best hunting fanny packs in the market. However, there are some fake manufacturers who create duplicate and poor-quality products. They also misspell the popular brand names and sell it at a low price. So, you should be aware of that too. We can ensure that you won’t make a mistake by choosing one of the listed fanny packs.